This week I'm waiting for... 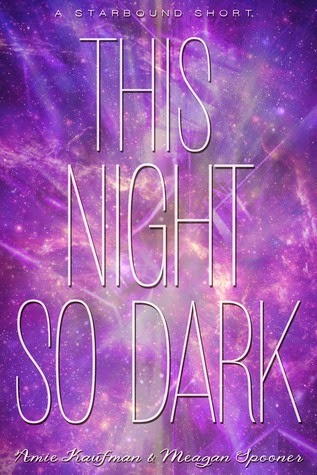 This Night So Dark which is an ebook for The Starbound Trilogy by Amie Kaufman and Meagan Spooner. The e-short, called This Night So Dark, will be available on all e-reader platforms on October 7, 2014, and it'll be free for all readers. It's a bit shorter than novella-length and a bit longer than short-story-length, and it's both a prequel AND a sequel. How's that? Read on! The story will follow Tarver, and the secret behind why he was on theIcarus when the great spaceliner met its epic end. Where'd all those medals come from? Why doesn't he want to talk about it? And if you're wondering how it can be a sequel at the same time, you just have to look at the format of These Broken Stars. That story's told out of order, too. In addition to Tarver's story, the e-short will also contain the first two chapters of This Shattered World, a full two months before the book hits the shelves! I read the first book in The Starbound Trilogy, These Broken Stars, at the beginning of the year and absolutely fell in love with it. It is one of my favourite reads of this 2014 thus far! When I heard that the authors would be releasing an e-book, I practically screamed. Reading These Broken Stars, I grew to love the main characters Lilac and Tarver, and at the end of the book I was left wanting more. Needing more. The synopsis for This Night So Dark makes me even more excited, I can't wait to delve back into this incredible world and learn more about Tarver and his history. Also, the e-book is going to contain the first two chapters of the next book in the series, This Shattered World. Can you hear me screaming? I CAN'T CONTAIN MY EXCITEMENT! You can almost guarantee that I will be downloading the e-book the second it is released. This Night So Dark is set to be released on October 7th, 2014. New follower via bloglovin. I really loved the first book in this series. I wasn't aware there was going to be a novella in between the first and second book. Great WOW Pick. Come visit me as well. Thank you so much for your kind words! I visited your blog and loved it too, followed you back on bloglovin' and also on twitter! Love this cover. I recently picked up These Broken Stars, after hearing how magnificent it was. I have no doubt that this and The Shattered World will end up on my TBR, as well. I really hope you enjoy These Broken Stars! Thank you for your kind words! I also read your recent WoW and I'm really looking forward to The Secrets We Keep! I really hope you get around to reading it soon and enjoy it just as much as I did! Thank you! I haven't read the first book in this series yet, but I've been wanting to. Great pick! I can't wait for you to read it! I hope you'll love it as much as I have! Thanks!